The 2008 USTA Florida Combo Adult 6.5 & 7.5 Section Championships finished Sunday, Jan. 12, 2009 after a weekend of exceptional tennis, sunny skies and great team camaraderie. Approximately 500 players representing 51 teams from throughout Florida traveled to Volusia County to compete in the event. The 24-court Florida Tennis Center (FTC) in Daytona Beach served as the tournament site. The level of play throughout the weekend was exceptional, which was evident by close match results. Added perks throughout the weekend, such as professional pictures for all teams (www.ustaflorida.printroom.com) and a new Cyber Center, added something special for every player to enjoy. Success was especially sweet for four teams who took home the prestigious title of section champion. In the 6.5 women’s division, a team from Jacksonville, captained by Yetta Goolsby, claimed the section title as they defeated a team from Gainesville/Lake City, captained by Tamara Gordon, 3-0 in the finals. The team, which plays out of Southside Tennis Complex, had a tough road to the championship. In their final match on Saturday, all eyes were on the team because their results dictated whether a team from South Miami-Dade advanced to the championship. “We knew something was going on when everyone was watching our last match on Saturday,” Goolsby said. In the semifinals, Jacksonville played against a tough team from Tallahassee, captained by Gina Field. Although they defeated Tallahassee 3-0, the matches were very competitive. Gainesville/Lake City defeated a team from North Palm beach, captained by Deborah Levitt, 2-1 in the second semifinal. In the 6.5 men’s division, a team from Gainesville/Lake City, captained by Mark Martin, went undefeated the entire weekend to win the championship. After playing just two years together, this was the team’s first Combo Section title. Before the finals could even take place in the men’s 6.5 division, a three-way tie had to be decided in flight II between, Ocala, Sarasota and Charlotte County (Punta Gorda); all teams were tied with 2 wins and 1 loss. The tiebreak came down to who had the least sets lost, which favored Punta Gorda since they had only 7 losses as compared to Sarasota’s 8 losses. 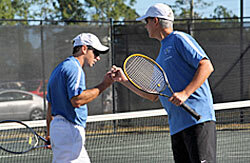 In the finals, the Gainesville/Lake City team defeated Punta Gorda, captained by Jim Round, 3-0. Gainesville player Bart Hutton said the friendship between the team helped them pull out a victory. In the women’s 7.5 division, a team from Jacksonville, captained by Lane Manis, claimed the section title. They play out of Boone Park and defeated teams from South Miami-Dade, Treasure Coast, and Daytona Beach in their flight contested Friday and Saturday to advance to the semifinals on Sunday. In the semifinals, Jacksonville swept a team from Gainesville, captained by Joy Ann Parker, 3-0. In the second semifinals, a team from Pensacola, captained by Tamara Moore, defeated a team from Tallahassee, captained by Diana Johnson, 2-1 to advance to the championship match against Gainesville/Lake City. The 7.5 women’s final was exciting as Jacksonville defeated Pensacola, 2-1, taking the No. 2 and No. 3 doubles positions while Pensacola snagged the No. 1 doubles position. This was the team’s first year together and first Combo victory. Looking to defend their title in the 7.5 men’s division was Pensacola. Captained by Calvin Moore, the defending champions played a team from Tallahassee in the finals. However; Tallahassee, captained by Scott McAnally, overpowered Pensacola in the No. 1 and No. 3 doubles positions for the victory, while Pensacola won the No. 2 doubles position in straight sets. The newly crowned champions play at Forrest Meadows Tennis Complex. The Tallahassee team won six out of six third set tiebreakers to keep them in the hunt for the championship trophy. 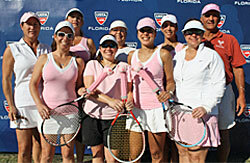 USTA Florida thanks all teams for participating in the fifth annual Combo Championships. 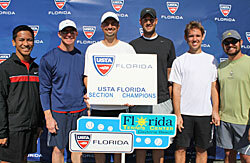 Special thanks to USTA Florida volunteers Ruth Ann Ott, Deb and Mark Anderson and tournament director Norm Ott. Your participation in USTA League Tennis helps support the game we all love.